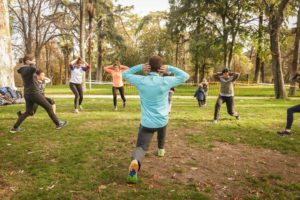 ¿What is Bootcamp style training? DiscoverDiscover the military-inspired physical activity that everyone is talking about. Many people are talking about Bootcamp but … What is Bootcamp? It is a high-intensity training inspired by the military physical preparation of the Marines. 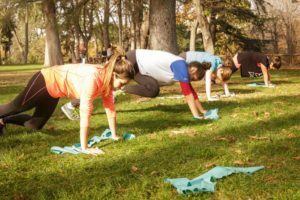 It is done outdoors, taking advantage of parks and green areas of cities, and mixes strength exercises with cardiovascular exercises. It is very effective for losing weight and gaining muscle tone in a few weeks. The sessions last for sixty minutes and stand out for their high intensity. They are very dynamic classes, with great variety of exercises. You will run, jump, box, and work all muscle groups, speed, strength and endurance. 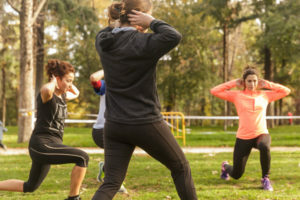 We use the elements provided by the environment (benches, stairs, trees …) and add equipment such as sandbags, kettlebells, elastic bands or coordination stairs. The result is fun sessions, very intense and, most importantly, adapted to any physical level. 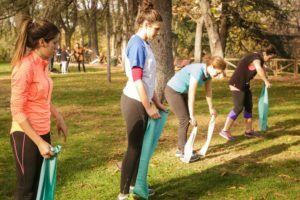 Discover our classes, the type of exercises that we do and how you will feel afterwards. Your first day at Bootcamp will be mostly fun. Hard, yes, but fun. 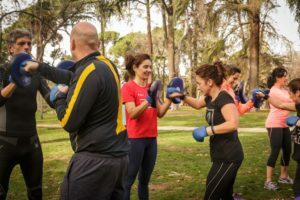 The first thing you will do is to meet with the instructor to check your fitness level and that you can do all the exercises without any risk of injuries. At Bootcamp, everyone does all the exercises. What varies is the intensity. During your first class, you will do less repetitions than your fellow bootcampers. As you gain muscle tone, you will increase repetitions. Each exercise works by time or by number of repetitions, which allows each one to work individually according to their capacity. · Continuous running, mobilizing the body. · Warm up adapted to the scheduled session. · Circuit: combination of high intensity exercises. Short stops between exercises. · Legs or abs work. During your first class the most important thing is that you learn the technique. It doesn’t matter if you do not do many repetitions. The instructors will teach you how to do each exercise correctly. It is important because you will avoid injuries and take full advantage of training sessions. Once you master the technique, you will progressively increase the intensity at each class. After your first class we guarantee two things: you will have stipes … and you will want to return to train as soon as possible.